I've made no secret how tough these last few months have been ... and I love the idea of having these simple, yet incredibly poignant reminders hung throughout my home. Not only do I appreciate their vintage flair, but also the fact you must take a mere moment to stop what you are doing in order to digest what they say. 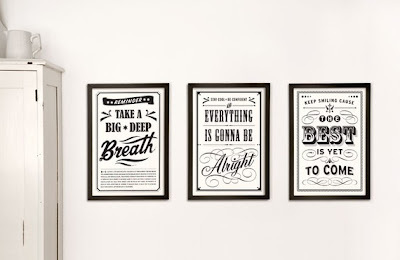 Eva Juliet is the artist behind these Three Vintage Posters. How about taking a moment to go over to her Etsy shop and see what else she's created. After all, the best is yet to come. Delightfully Dishy's Official Summer Cocktail!